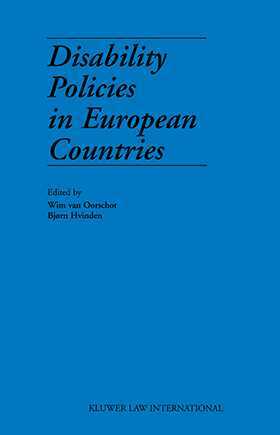 This book aims to review and discuss the disability policies that have developed in six Western countries in recent years. What have been the major changes? Have the disability policies of these countries become more similar in the course of the 1990s? If so, is it possible to identify a closer relationship between the emerging EU Disability Strategy and national policy developments in this area? The countries discussed--Sweden, Denmark, The Netherlands, The United Kingdom, Ireland and Spain--are al represented in an academic network on vocational rehabilitation of disabled people that seeks to understand and compare policy developments in the field. All articles include detailed information on recent changes in disability policies in the respective countries. Authors include Mike Floyd, John Curtis (UK), Miguel Angel Verdugo, Antonio Jimenez, F.Borja Jordan de Urries (Spain),Wim van Oorschot, Kees Boos (The Netherlands), Steen Bengtson (Denmark), Francesca Lundstroem, Donal McAnaney, Beverly Wester (Ireland) and Rafael Lindquist (Sweden).